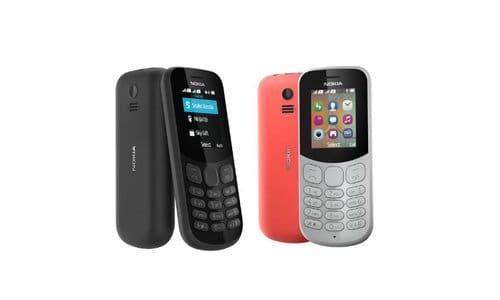 HMD Global, the home of Nokia phones has launched a new version of the Nokia 130 phone. Dubbed as the Nokia 130(2017), the device is priced at Rs 1599 and is available for purchase via offline retailers. It is available in three colors- red, gray and black. The Nokia 130(2017) features a 1.8-Inch QVGA color screen and is targeted at the low budget feature phone segment. The phone boasts of up to 44 hours of FM Radio playback and features 4MB RAM with 8MB of internal storage, however, it has the capability to support a microSD card of up to 32GB. The feature phone claims to offer up to 11.5 hours of video playback on a single charge and runs on the Series 30+ software. The Nokia 130 features Bluetooth support for a headset or speakers – perfect for wire-free listening to your favorite MP3 playlist on the go. The device comes preloaded with the ever popular Snake Xenzia and also features a bundle of five try and buy games from Gameloft – Ninja Up, Danger Dash, Nitro Racing, Air Strike, and Sky Gift. It has the ever popular LED Torchlight making sure you’re ready for anything day or night – simply press the up key twice for quick access to turning the torch on and off. Nokia 130 comes in Dual SIM variant.